The Mitsubishi Outlander PHEV is the world’s best-selling PHEV crossover and now the U.S. finally gets to see why. After a few years of waiting, the Mitsubishi Outlander PHEV has come to University Mitsubishi. Unlike other PHEV models, the Outlander PHEV is unique because it features super all-wheel control, which is Mitsubishi’s unique all-wheel drive system, so not only is the Outlander PHEV a fuel-efficient SUV that has plenty of room passengers, but it can also go off-roading and has great towing capabilities. There are two other factors that make the Outlander PHEV stand out from other PHEVs on the market. The Outlander PHEV is the only plug-in hybrid available with DC Quick Charging, so it can be recharged really fast, and the Outlander PHEV is extremely affordable! Keep reading if you want to learn more about the Mitsubishi Outlander PHEV. The Mitsubishi Outlander PHEV is equipped with an electric powertrain and a gasoline powertrain, and these powertrains can work together or work independently. The gas powertrain is a 2.0-liter four-cylinder engine that produces 117 horsepower and 137 lb-ft of torque. The electric powertrain is made up of twin motors and a 12 kWh lithium-ion battery. The front motor produces 60 horsepower and 101 lb-ft of torque and the rear motor produces 60 horsepower and 143 lb-ft of torque. Because the Mitsubishi Outlander PHEV can be powered a three different ways, it has a few different fuel economies. When the battery and gas engine are working together in hybrid mode, the Outlander PHEV has a combined city/highway fuel economy of 74 MPGe (miles per gallon equivalent) and a total driving range of 310 miles. When the Outlander PHEV is only powered by its gas engine it has a combined city/highway fuel economy of 25 MPG and when it is only powered by electricity, the Outlander PHEV has a total driving range of 22 miles. There are three ways the Outlander PHEV can be recharged. There is a 120-volt charging option, a 240-volt charging option and the DC Quick Charging option. When using the DC Quick Charging option, the battery in the Outlander PHEV can be recharged to 80% full in as little as 25 minutes. When hooked up to a 240-volt Level II charger, the Outlander PHEV can be fully recharged in 3.5 hours and when hooked up to a 120-volt Level I charger, the Outlander PHEV can be recharged in 8-13 hours, depending on the amp. There are two Mitsubishi Outlander PHEV trims, the Outlander PHEV SEL S-AWC and the Outlander PHEV GT S-AWC, and both trims are well-equipped and comfortable. The Outlander PHEV comes standard with an HD radio, a 7-inch Smartphone link display, Bluetooth Wireless technology, 12-volt accessory outlets, and dual-zone automatic climate control. The Outlander PHEV SEL A-AWC is equipped with a six-speaker audio system and a rearview camera, and the Outlander PHEV GT S-AWC has an upgraded 9-speaker Rockford Fosgate audio system and a multi-view camera system. The Outlander PHEV has a modern exterior design and great convenience features. The Outlander PHEV has LED running headlights, LED rear combination tail lights, dark chrome grille accents and 18-inch two-tone alloy wheels and both Outlander PHEV trims are also equipped with a power remote liftgate. The Outlander PHEV GT S-AWC features LED fog lights and LED headlights, whereas the Outlander PHEV SEL S-AWC has standard fog lights and halogen headlights. Aside from all of the excellent equipment and the Outlander PHEV’s fuel efficiency, the Outlander PHEV is an awesome choice because it is affordable, available with a federal tax credit and it’s backed by an awesome warranty! The 2018 Mitsubishi Outlander PHEV has a starting MSRP of $34,595 (plus destination fee) and it qualifies for a $5,835 federal tax credit. The Mitsubishi Outlander PHEV is backed by a few different warranties. 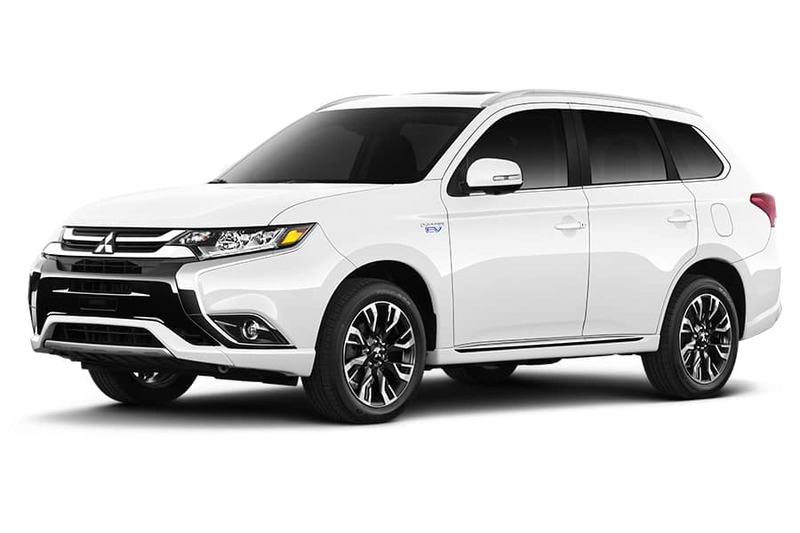 The Outlander PHEV is backed by a five-year or 60,000-mile limited basic warranty, and a 10-year or 100,000-mile limited powertrain warranty, a 10-year or 100,000-mile limited PHEV parts warranty, and the main drive battery is backed by a 10-year or 100,000-mile warranty.